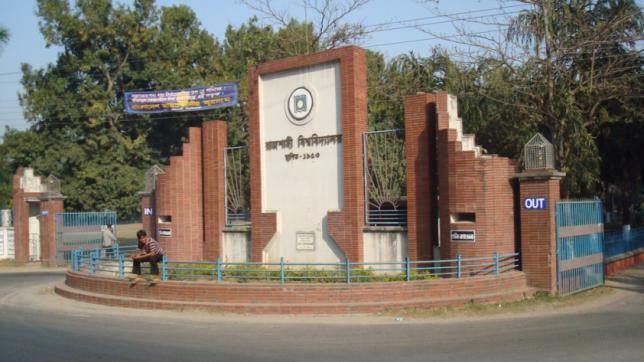 The admission test for the first year honours courses in 2018-19 academic session of Rajshahi University (RU) will be held on October 22 and 23. A total of 88,543 students will appear in the entry test under five units, which are – A unit (Arts and Fine arts faculty), B unit (Business Studies and Business Administration Institute), C unit (comprises of Science and Engineering Faculties), D unit (Life and Earth Science Faculties) and E unit (Law and Social Science Faculties and Education and Research Institute). The candidates will have to sit for 100 marks MCQ test with one hour duration. This year, a total of 4,173 qualified students will get chance for admission in 59 departments and two institutions. RU Vice-chancellor Prof Abdus Sobhan revealed this at a pre-test press conference at Senate Building on the campus in Rajshahi on Friday. All sorts of necessary preparations for holding the test were completed, he told the press conference. He said results of the two-day admission tests will be published by November 15 and admission process will start from November 25. Classes of the newly admitted students will start from January 21 next year, Prof Sobhan added. Detailed information for admission test will be available on www.ru.ac.bd website. Detailing the preparation of the entry test, he said there is no scope of question lickage. “All we university teachers irrespective of party and opinion affiliation are working relentlessly to make the test a total success,” the VC added. Prof Sobhan said the application process has been completed through check and crosscheck. So, there is no chance of any forgery through proxy. Modern technology will be used for preventing forgery. Above all, stern action will be taken against those found to be guilty in any stage of the process. He also said the law enforcing agencies were requested to extend their cooperation to complete the process successfully. Pro-VC Prof Chowdhury Md Jakaria, Registrar Prof Abdul Bari, Treasurer Prof Mustafizur Rahman, Proctor Prof Lutfor Rahman and Students Adviser Prof Laila Arjumand Banu were present at the press conference.